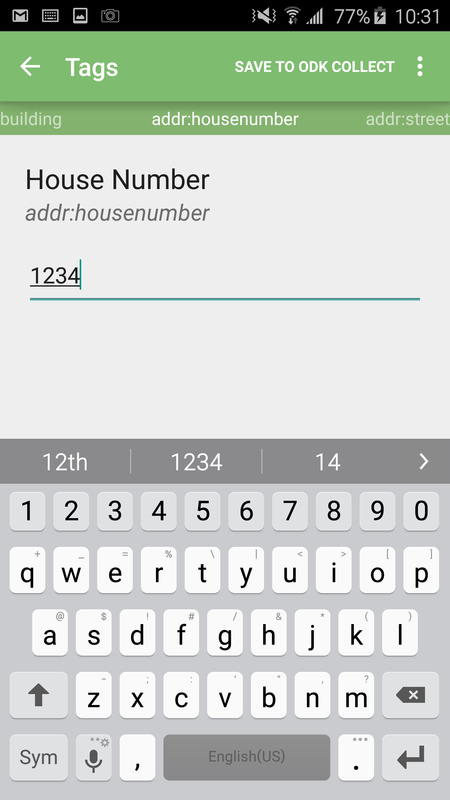 This walkthrough is intended to take you through the entire process of setting up and using the OMK application from start to finish. 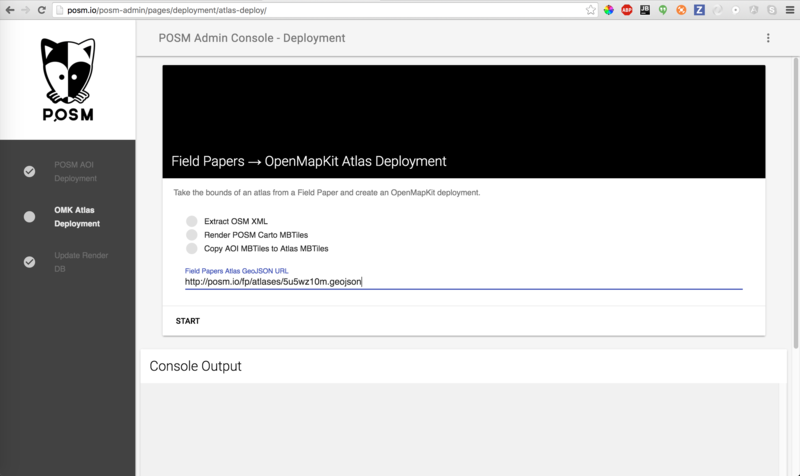 For an actual deployment of OpenMapKit Server, it is recommended to use posm-build to install your instance. 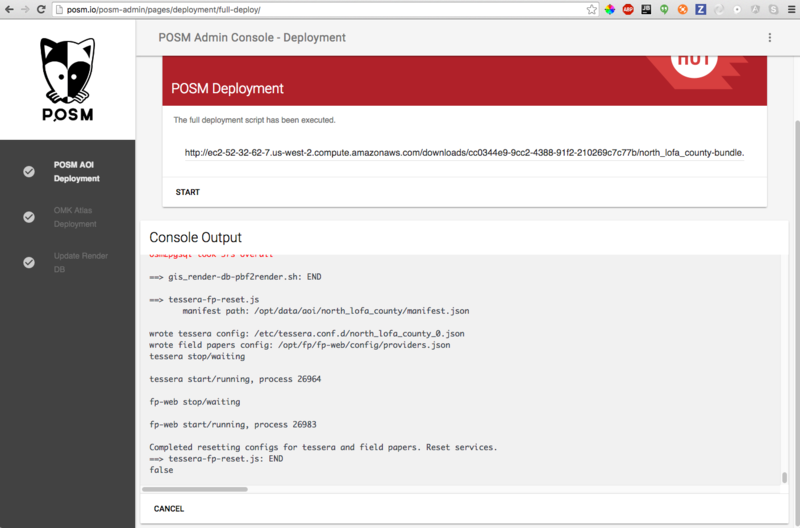 posm-build is a lightweight shell build system used for POSM servers. 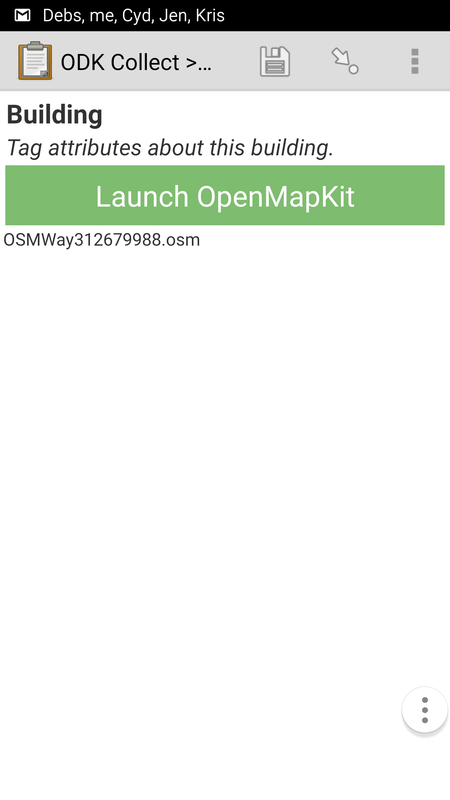 OpenMapKit Server is designed to be a part of a POSM server, however, the posm-build allows you to be modular regarding what gets installed, so you can and should use it if you want to install a standalone OpenMapKit Server. 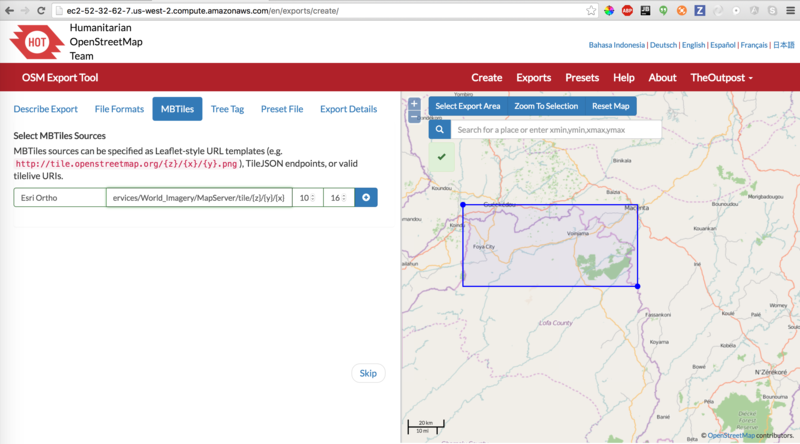 The advantage is that in a few lines, you can have OpenMapKit Server installed and integrated as an Upstart service in Ubuntu Linux. 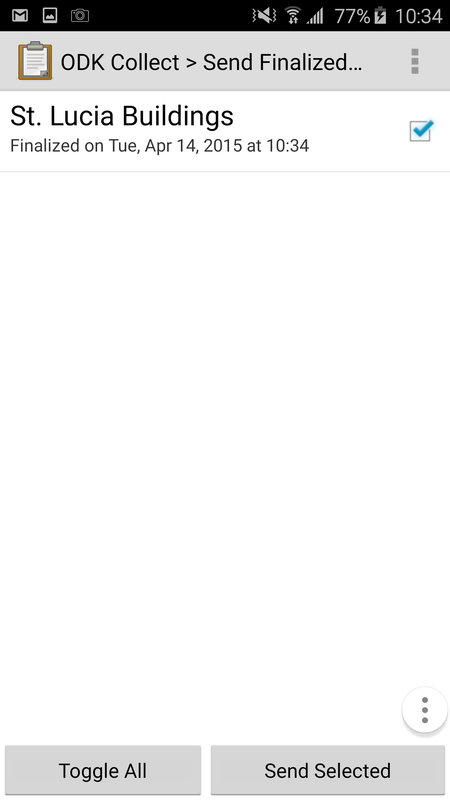 This means that if OpenMapKit Server crashes or is restarted, the API will restart automatically. Also, posm-build only gets the dependencies you need and downloads only the files you need, so the entire repo does not need to be cloned with git. Instructions for installing OMK Server on your development environment can be found here. 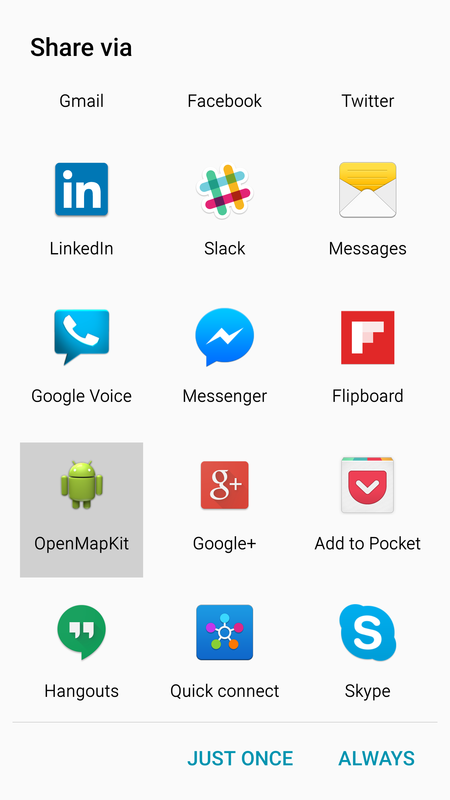 OpenMapKit Server is intended to be as light-weight as possible, so you don’t have to throw much hardware at it. Replace the IP address for posm_ip with the actual public IP or your server. 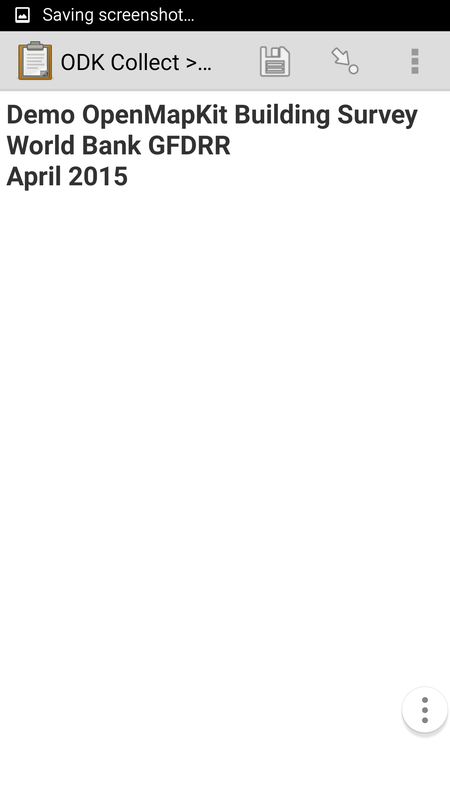 If you are on Amazon, this should be your Elastic IP. 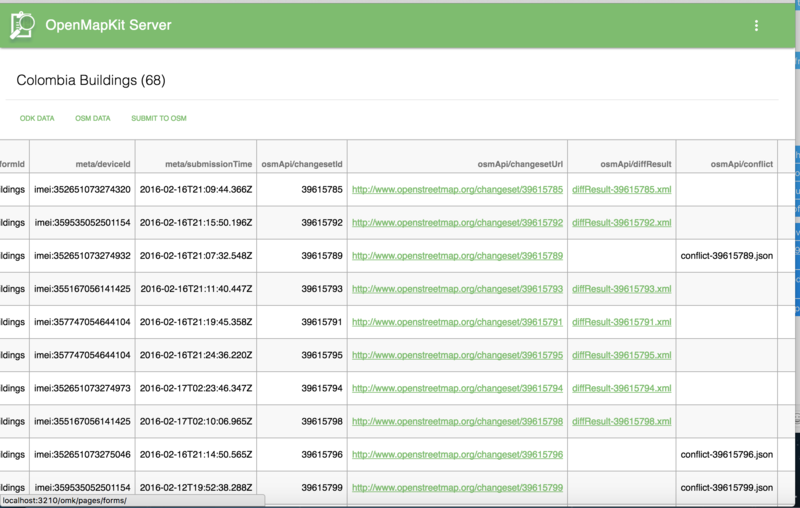 Execute bootstrap.sh and tell it to only install NGINX and OpenMapKit Server. Let the installation churn. That’s it! You can start / stop / restart the omk-service like any Ubuntu Upstart service. 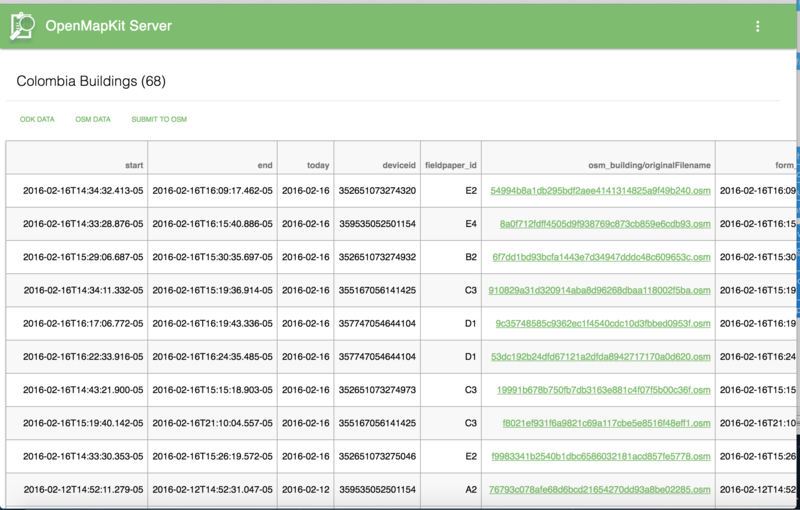 All of your data are stored in /opt/omk/OpenMapKitServer/public. from the server to backup and access your data. There is no database, so all of your data are in these files. 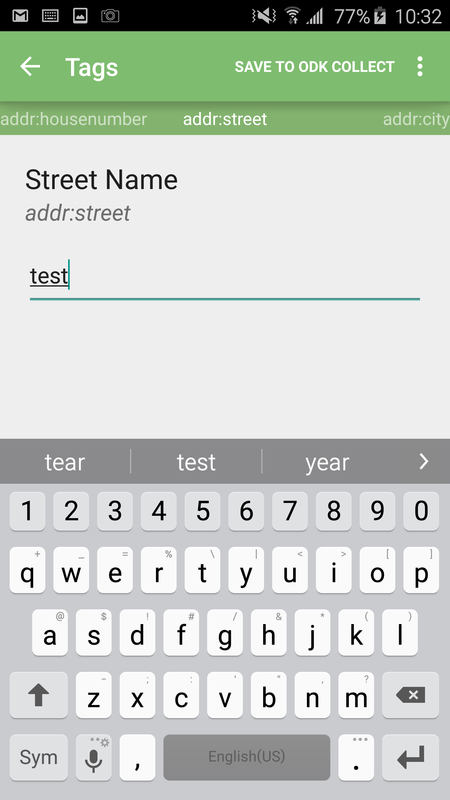 Creating forms for ODK or OMK can be as simple or complex as the survey itself. In most cases this step can be completed in under an hour. 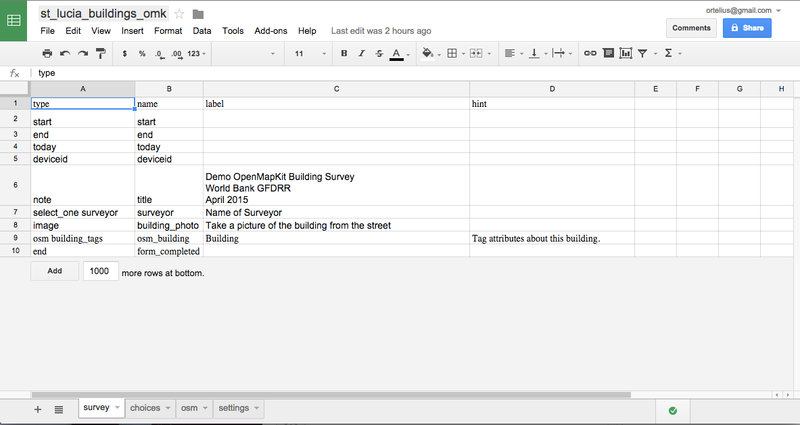 More detailed documentation for how to correctly create a survey form can be found in the Creating Surveys for OMK tab in the Users documentation. 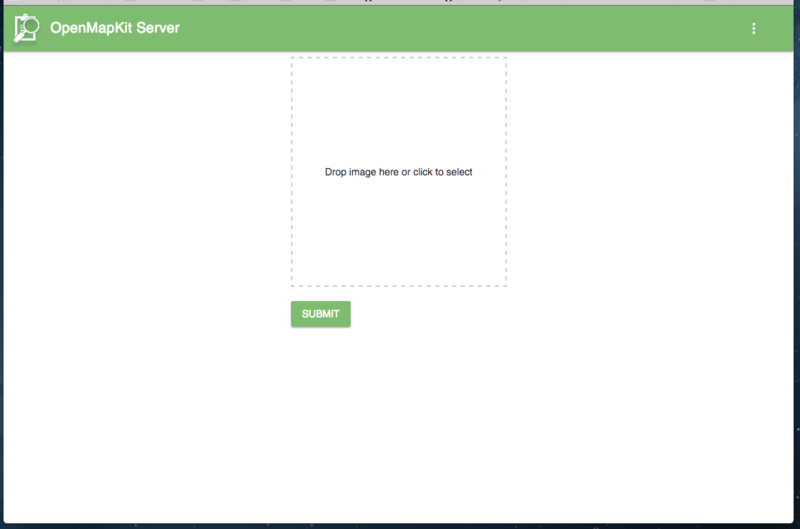 By opening the OMK Server UI. 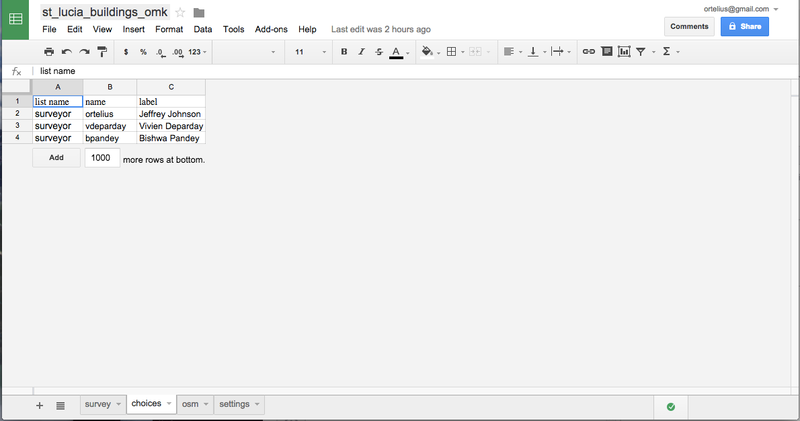 Clicking in the upper right corner will give you a drop down menu, click Upload Form to upload your survey. 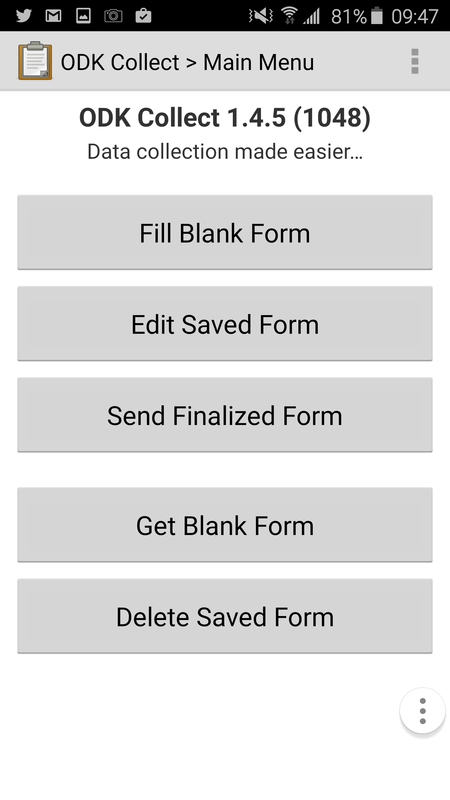 You can drag-n-drop your form or click to select it. Then hit Submit to add your survey to your OMK Server. 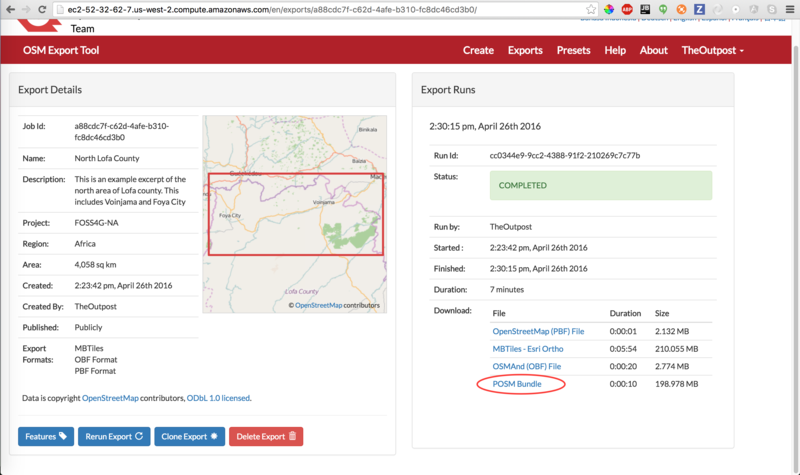 Once your export is completed, right click on POSM Bundle and copy the URL. 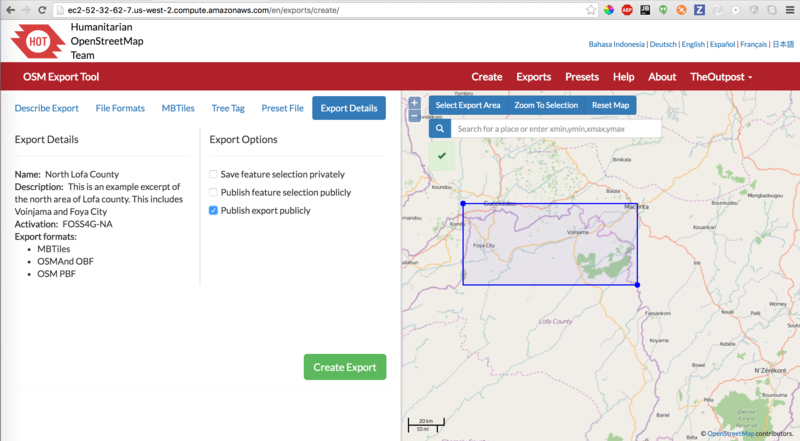 The POSM needs to fetch the data generated by the HOT Export tool, load it’s databases, and setup it’s applications for the Area of Interest. 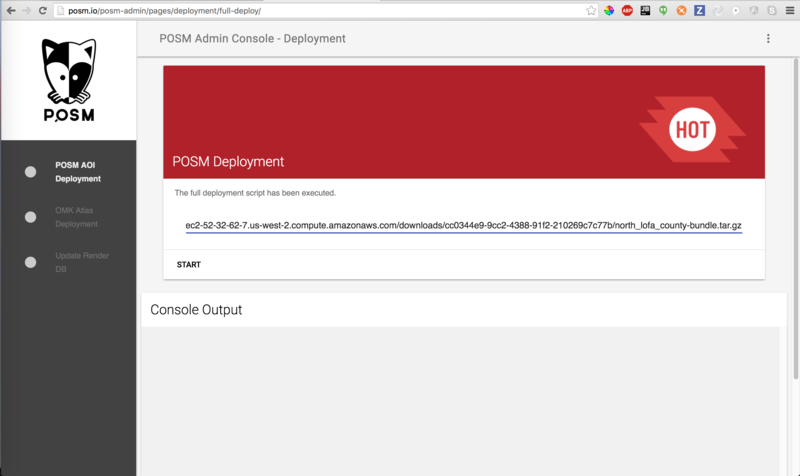 Paste the POSM Bundle url in the text area and START. When the POSM Area of Interest (AOI) Deployment is complete, you will see a check box next to the task, and the console output will say ==> tessera-fp-reset.js: END false. This means that it is finished. 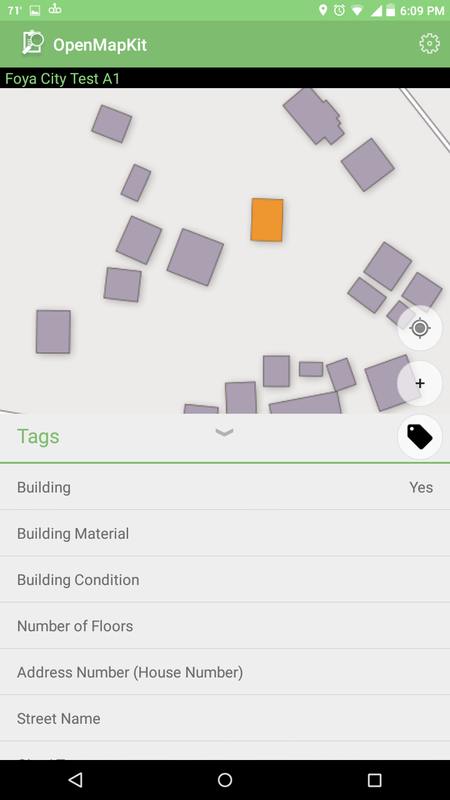 It may take a little while to start cutting tiles, but zoom out and zoom into the area that you loaded. You should see tiles being drawn. 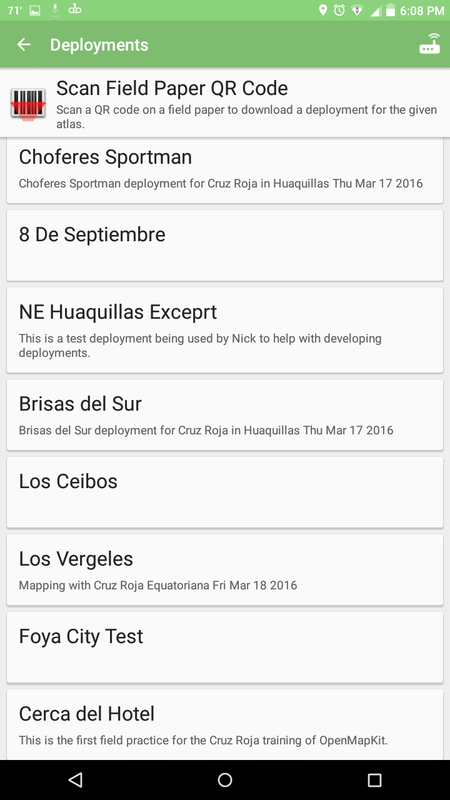 The deployments that you see in OpenMapKit are based off of the bounds of a Field Paper atlas. 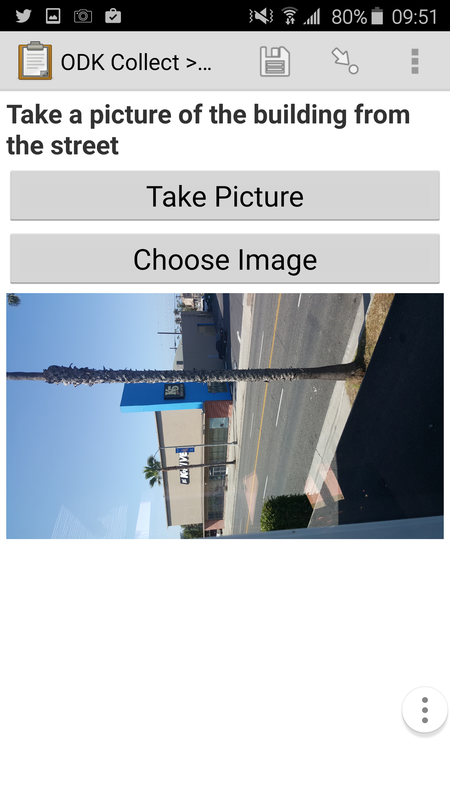 The entire Area of Interest is too large for the phone, so instead, our deployment is based off of a field paper atlas. 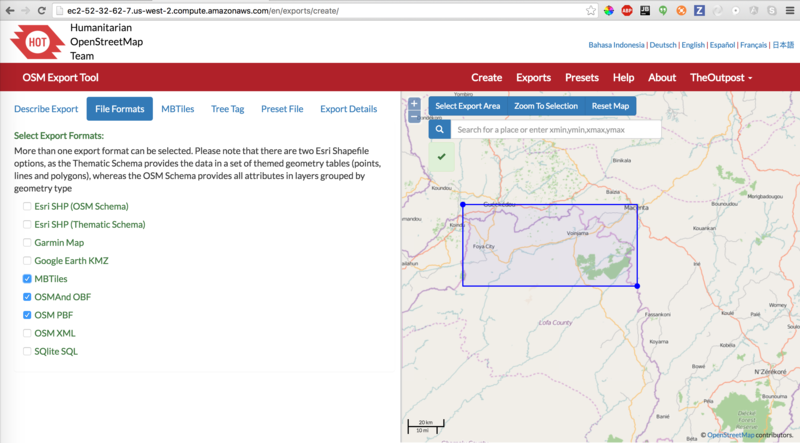 When you create a field paper, an atlas is generated, and we are using it’s slug for the name, the title for the title you gave the field paper, and the GeoJSON for drawing the bounds of each field paper page in OpenMapKit. 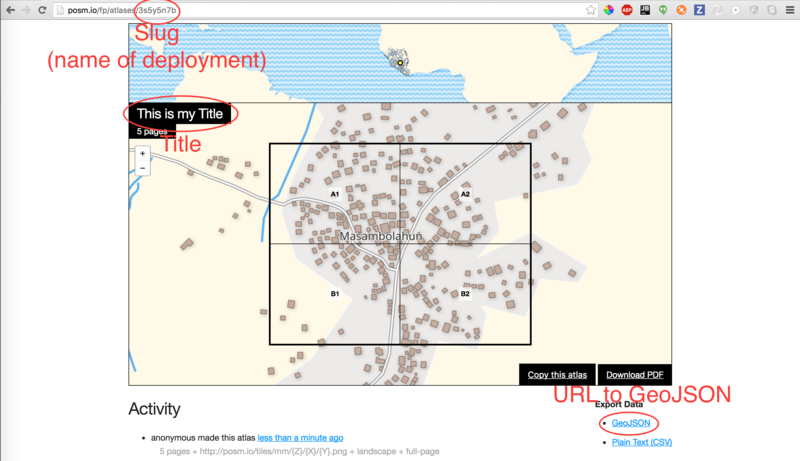 This step is soon to be automated, but now we manually enter the URL to the Atlas’s GeoJSON. This data encompasses the shapes that make up both the atlas as a whole as well as each page in the atlas. It also includes necessary metadata. 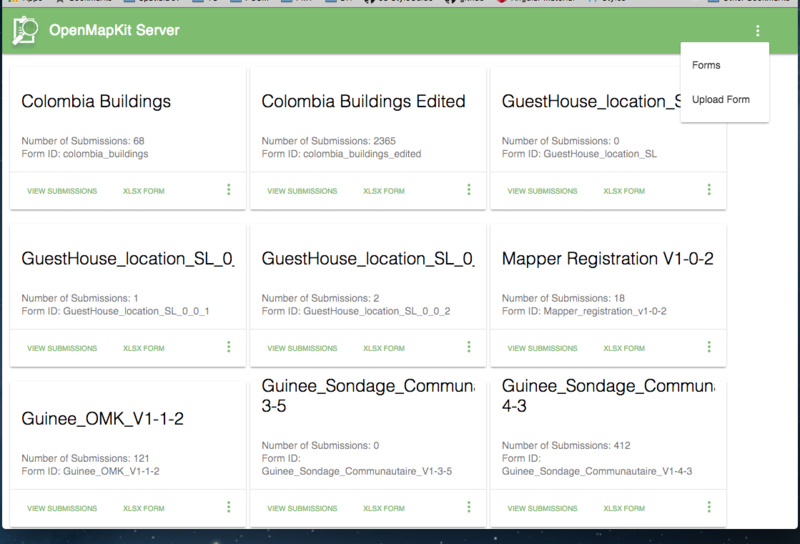 We are using this data to generate a deployment for OpenMapKit. The name of the deployment is the slug, and the title is the title you gave the field paper. 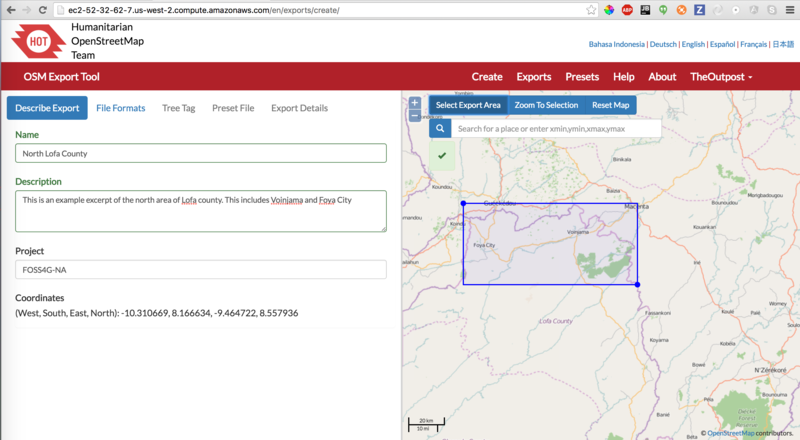 POSM is generating OSM XML from the API Database, POSM Carto MBTiles, and an extract of any other MBTiles included with the AOI. When the deployment is complete, you should see ==> gis_omk-posm-mbtiles.sh: END false. You should also have all of the steps checked off. Make sure your phone is connected to the POSM wifi network. The QR Code will be read, and it will bring you to the corresponding deployment. Now you can download it by pressing the button in the lower right. 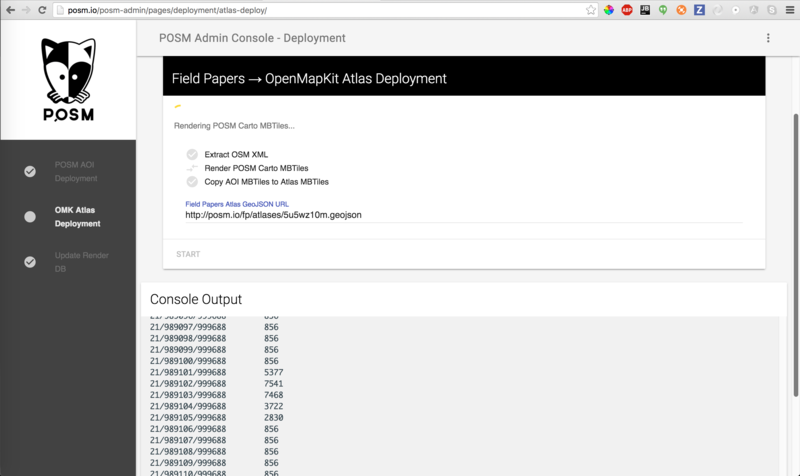 If you jump back to the previous screen, you can see the list of deployments on the POSM’s OpenMapKit Server. Once your download is complete, there will be a new button in the bottom left to Check Out your deployment. 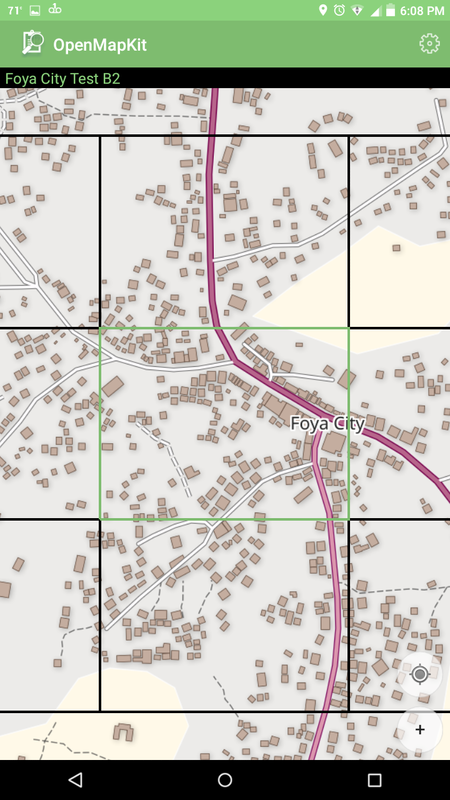 This will turn on the POSM Carto MBTiles and OSM XML on the map for you. 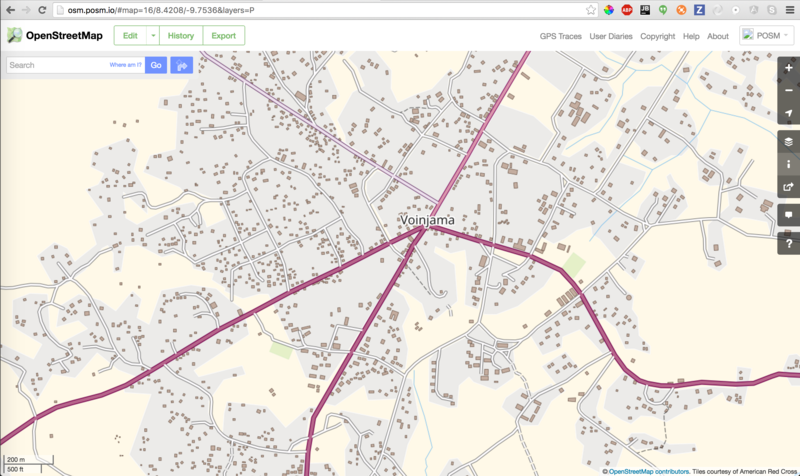 You should also see the bounds of your field paper atlas pages. The top of the map should show the page that is green below. 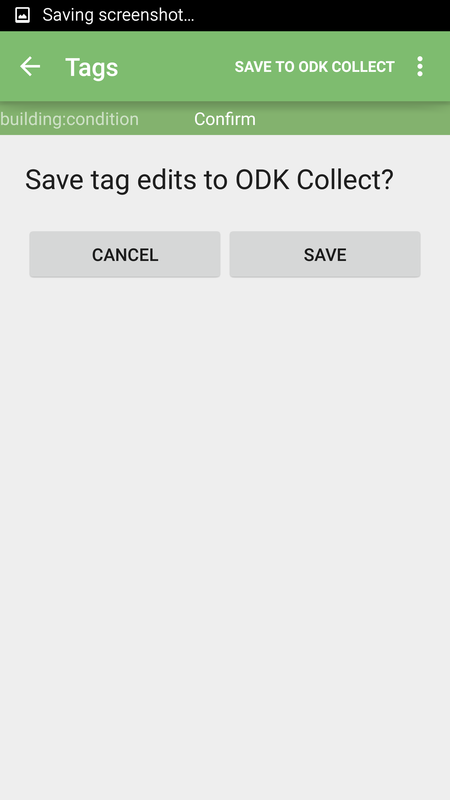 Before, you always had to start with ODK Collect. 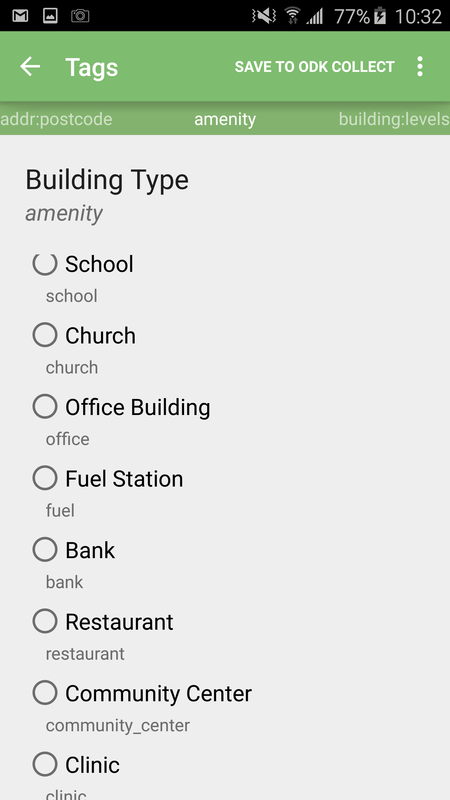 Now, if you start from OpenMapKit and try to edit a feature, the app will lead you back to ODK Collect to fill in your survey. 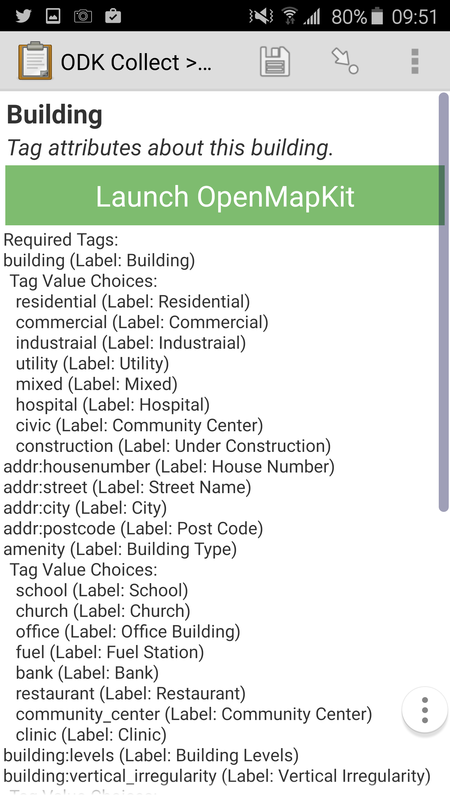 Once you’ve gotten back into OpenMapKit from ODK Collect, you can edit tags as usual. 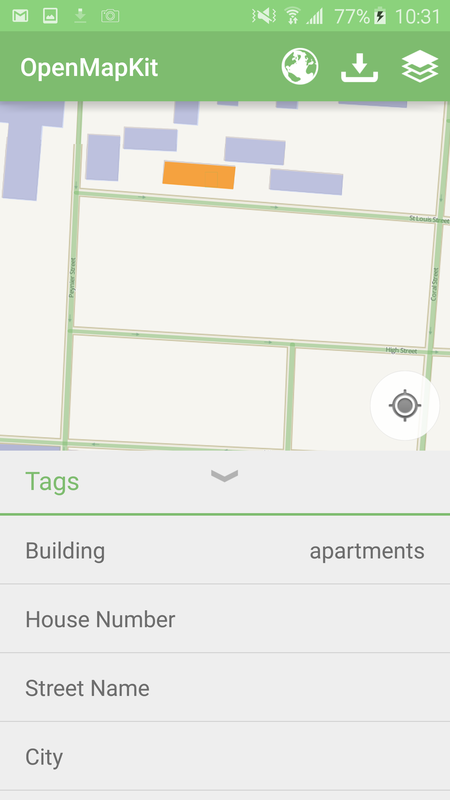 You can click on any feature on your map to edit it. Click on Send Finalized Form(s) to get to the upload dialogue. 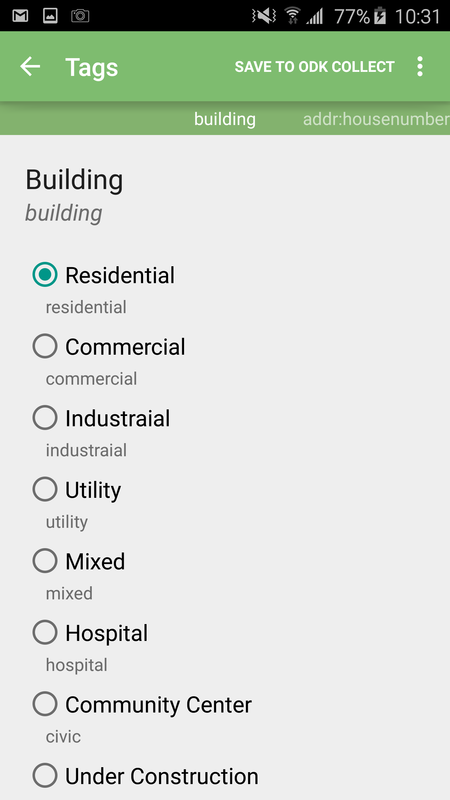 Select all the forms you want or click Toggle All. When you’re read click Send Selected to upload your completed data to the server. 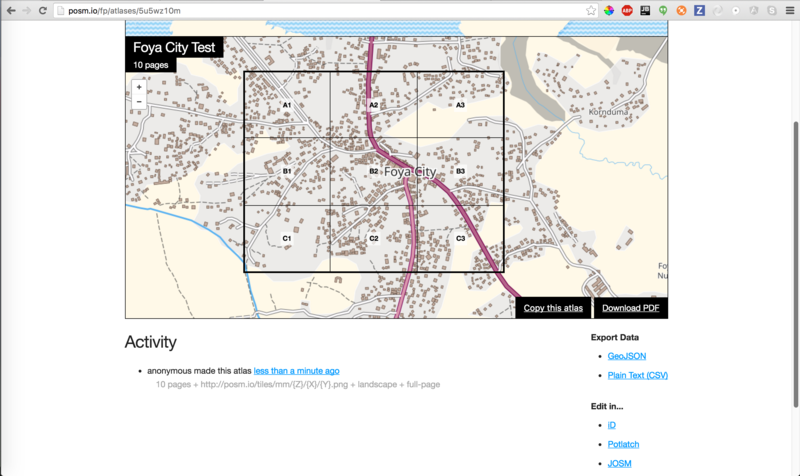 Submissions can be viewed, downloaded and submitted to OSM from OMK Server. 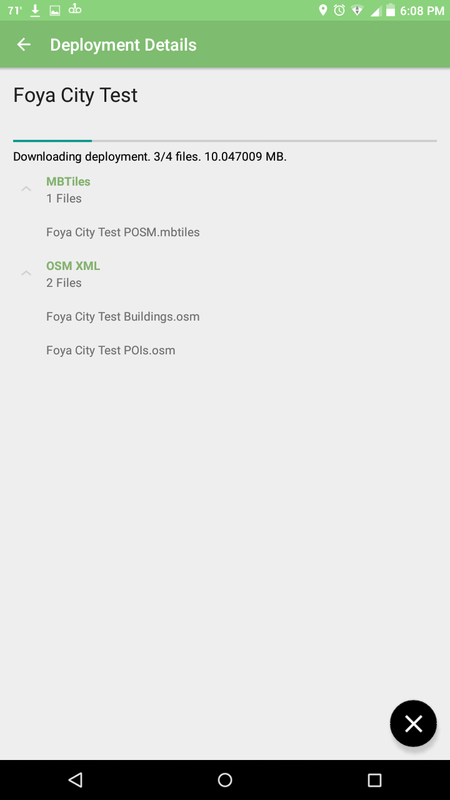 To access submitted forms and data, first open the OMK Server UI. Click on the the View Submissions tab of the survey you would like to view. 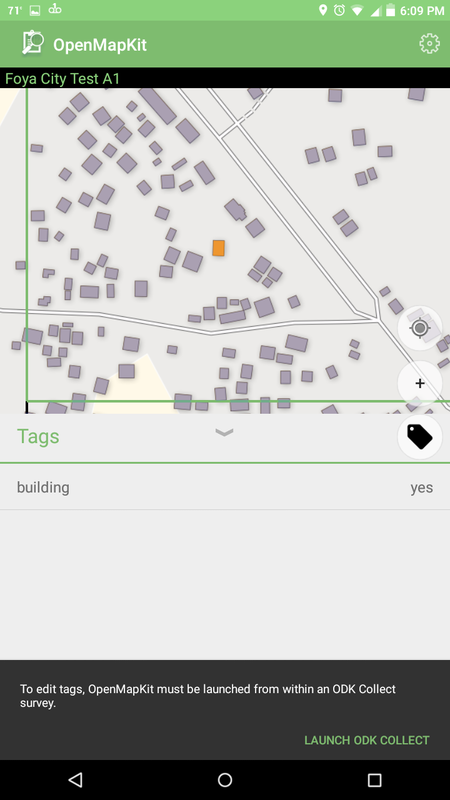 You have the options to view & download the ODK data, view & download the OSM data and the ability to submit the OSM data back to the OSM API. 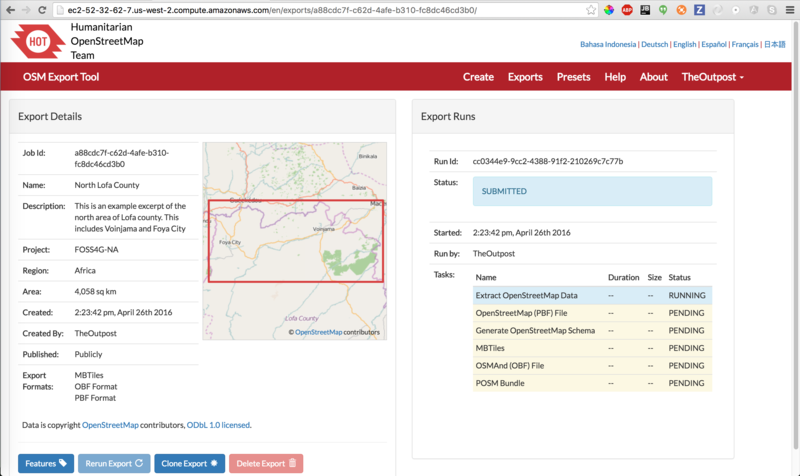 If there are any conflicts that occur when submitting data back to the OSM API, the submission will fail. Conflicts will be flagged and have to be resolved manually using the POSM Changeset Replay Tool. The Changeset Replay Tool is a workflow for resolving conflicts. It uses a local Git repository containing the current state (local edits), transform it so that it contains the new desired upstream state (what OSM should look like after merging), and apply the necessary transformations (in the form of API calls) to update the upstream state. You should already have a copy of this file. psql -d osm_posm -t -c "select id from changesets where num_changes > 0 order by id asc limit 1"
git commit -m "Branch point"
Filter the AOI extract according to entities referenced in local changesets and apply to a new branch. This ensures that there’s a common ancestor when moving commits between branches. git commit -m "Current OSM"
This is effectively what has already occurred through editing using the OSM API, although doing it in git terms allows us to more easily move changes between branches. Walk through all local changesets and apply them to the upstream branch. This will open your configured git mergetool (opendiff / FileMerge on OS X), allowing you to resolve conflicts manually. 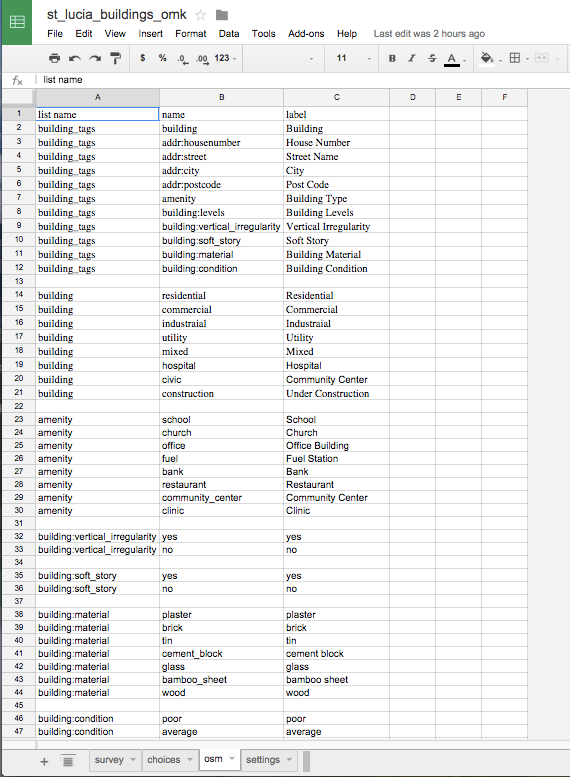 Create a new branch for changesets that have been applied upstream and walk through all local changesets, submitting them and renumbering (remapping entity IDs and references) as necessary. ID remapping information will be left behind in .git/map.json (cumulative) and .git/<commit>.json (per-changeset). 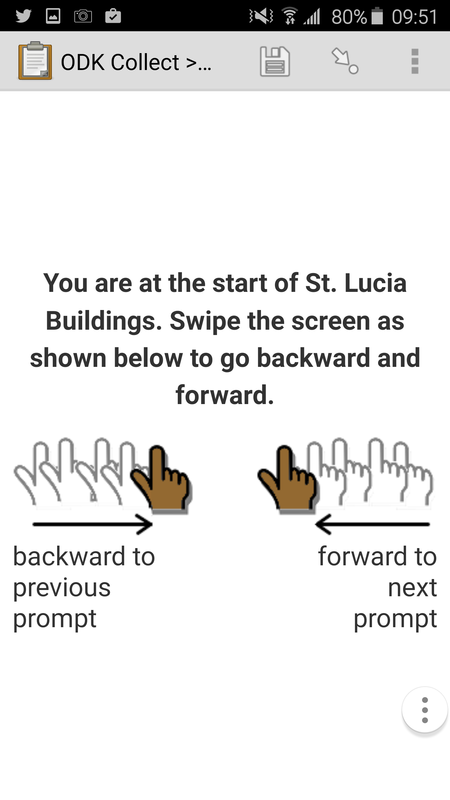 watch "git --no-pager log --reverse --format=%h upstream..osm | wc -l"
The Git repository we produced includes all of the history and context used for reconciliation. Once synchronization has been completed, its primary purpose is as an artifact of the merge process. Rather than partially applying upstream changes to POSM’s database, it’s much easier to replace all of the data with a new extract.